Australia is filled with excellent locations for nature lovers where you can explore the local countryside and hike and camp in paradise. One of the most scenic and adventurous of these destinations is Inskip Peninsula Recreation Area, which is located on Queensland’s Cooloola Coast and only about 5 miles away from the popular Rainbow Beach. Also, Cairns is another great city by the beach. You find many Cairns holiday ideas on the internet. The recreation area is usually referred to as Inskip Point and is a favourite annual camping ground for hundreds of local families. The peninsula is surrounded to the east by the warm waters of the Pacific Ocean and to the west of it you’ll find the Great Sandy Strait and Tin Can Bay. The setting is ideal for families who like to unwind and relax while surrounded by the natural beauty of Australia. There are four different campgrounds to choose from at Inskip Peninsula, with each one of them being named after a local shipwreck. These campgrounds are the M.V. Beagle, the S.S. Dorrigo, the M.V. Sarawak, and the M.V. Natone. The M.V. Sarawak campground is quite popular for larger groups and it can be reached by two-wheel drive vehicles. You’ll find that the campgrounds don’t have any fresh water supply and shower facilities, but they do come with hybrid or self-composting toilets. You’ll also find garbage cans are supplied close to the exits of each ground and dogs are certainly welcome to join you as long as they’re kept on their leashes at all times. 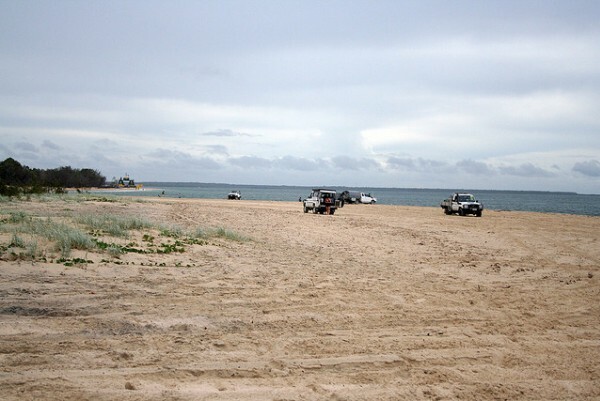 Along with camping, four-wheel driving is also quite a popular outdoor activity at Inskip Point. However, if you are not into that type of thing you will be able to enjoy a host of other activities such as sailing, fishing, swimming, picnicking, bird watching, and hiking. You won’t have to look far to find something fun to do. If you would like to camp out at Inskip Point, you will need to get yourself a camping permit before pitching your tent. This isn’t too hard to do though. You can buy a permit online before your trip. You can also purchase permits at the Queensland Parks and Wildlife Service, which has an office set up in nearby locations including Rainbow Beach, Gympie, Maryborough, and Tewantin. You should also be aware that you are not allowed to take any unmilled firewood into Inskip Point since it’s possible that it could contain some type of disease which could harm the area’s local flora. You’re also not allowed to cut any trees or gather branches from the area’s bushes. If you’d like to enjoy a campfire the best thing to do is buy some firewood in Rainbow Beach. If you take a vehicle along the waterfront at Inskip Peninsula Recreation Area, you must abide by all of the local laws of the road. Keep your eye out for other riders, campers and beach users as well as the wildlife. If you obey all of the rules you should have an excellent time enjoying the wilderness in this area of Australia. You’ll be able to breathe in the fresh air and learn about nature while spending some quality time with your family and/or friends.